We don't just promise. We Deliver! At Prostrollo Auto Mall, we're committed to making the process of purchasing your next vehicle as easy and enjoyable as possible. Whether you prefer to communicate via phone, text, Facebook, email, or in person, our friendly and experienced sales team can help you with any questions you may have anyway you want to be contacted. We know it can be hard to get to the dealership with your busy schedule, so we’ll deliver right to you. We can prepare your paperwork, and deliver your new vehicle whenever and wherever it is most convenient for you! Allowing you more time for the things you enjoy. Prostrollo Auto Mall makes the delivery process easy. The delivery process is simple at Prostrollo Auto Mall. Browse our inventory online to see our many options for new vehicles from Chevrolet, GMC, Buick, Cadillac, Chrysler, Ram, Dodge, Jeep, Ford and Lincoln. In addition, you can shop over 200 top quality pre-owned cars, trucks, SUVs and crossovers including many GM and Ford Certified Pre-Owned. If by chance you don't see the vehicle you're looking for, let us know and we'll find it for you! Have a trade, no problem, you are always guaranteed a fair price at Prostrollos. Need financing? Our finance experts can help you and your family find the best rate, terms and conditions to make your next vehicle fit your budget. We also offer GM, Ford, and Chrysler manufacture backed service agreements to give you piece of mind on your purchase. After these quick and easy steps, our sales team can schedule the delivery of your new or used car, truck, SUV, or crossover to your home or office. Complete the process with a few signatures, and you will be on your way! 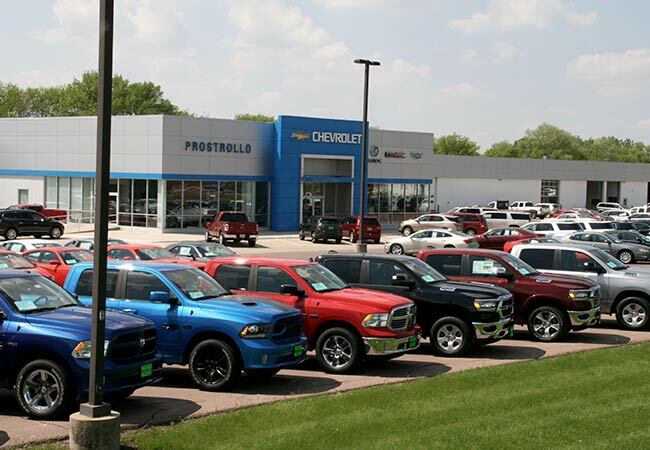 Buying a new or used vehicle has never been easier than when you shop at Prostrollo Auto Mall, family owned since 1957.